It is a popular traditional method of performance appraisal. 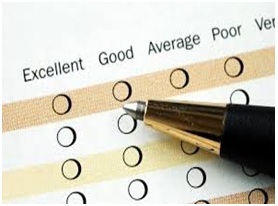 In this method, a rating scale is created to evaluate the performance of employee against certain parameters. These parameters usually include his attitude, attendance, punctuality and interpersonal skills. The rating scale used in this method ranges from 1 to 10. Low score indicates negative feedback and high score indicates positive feedback. In this method, a checklist is prepared. It is comprised of descriptive statements related to behavior of the employee. Each statement has two options, Yes & No or True or False. The rater can choose one out of two options which he thinks correctly describes the behavior of the employee. 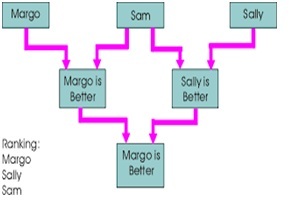 This method was popular in big organizations. It is based on the fact that the performance of employees varies greatly in an organization, some would be more productive and some would be less productive. So in this method, the manager is forced to distribute employees on the basis of their performance on all points of the bell shaped scale. 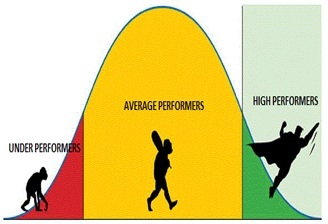 Some fall into outstanding zone, some into average and some into the bottom region of the curved scale. On July 22 the manager efficiently handled an annoyed customer. He was very prompt and polite in solving the issue ? It is a positive critical incident. On July 22, the manager was very rude in handling an annoyed customer ? it is a negative critical incident. 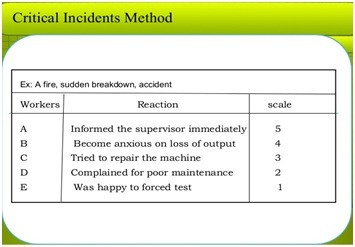 In this method, the rater writes a description about the behavior and performance of the employee. The description includes all relevant information like employee?s attitude, job knowledge, current performance and potential for growth. There are five employees A,B,C,D,E who are to be evaluated. So on applying the formula 5(5-1)/2, there will be 10 pairs to be compared. This method is based on superiors' opinion on the performance, behavior and skills of the employee. The HR specialist asks seniors to answer questions related to employee's employment and appraises the employee on the basis of feedback received from the superiors. This method is mostly used in government organizations to make decisions regarding promotion and transfer of the employees. 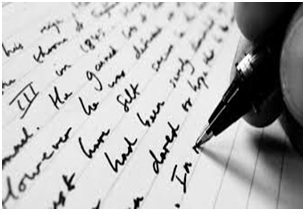 The senior prepares the confidential report on the performance, behavior and other traits of the employee. The report is supposed not to be revealed to anyone. It is sent in a sealed cover to the concerned officials who appraise the employee on the basis of this report and take decisions accordingly.